iOS 12 VS iOS 11: Which Apple Operating System is Better? Since the invention of Apple’s mobile device operating system, Apple’s iOS development engineers have had their focus fixed on making iOS devices do more, rather than improving on the efficiency and quality of what is done. However, with the invention of iOS 12, Apple is approaching development from the angle of speed and performance rather than bringing more features to iOS. Therefore, if Apple claims that iOS 12 should not be judged based on features but on performance, then let’s compare it with iOS 11 to see how well it will perform. Part 2: Should I Run iOS 12? What features will Apple iOS 12 come with as it’s launched this summer? We’ve made a list of these features, and what makes them better in iOS 12 than iOS 11. The new iOS 12 Home Screen Feature will be cleaner than that of iOS 11. The Home Screen will include apps with only icons and no names written below them. Don’t forget that iOS 12 will be coming with new and finer wallpaper, which is more preferable to the one in iOS 11.
iOS 12 will come with a new soundbar that would be located at the top of the iOS Home Screen in order to allow quick access to volume control while using your iOS device. This is not the same with iOS 11 soundbar which hidden below the home screen, and you have to flip up your iPhone screen to see. Facial Recognition is going beyond opening the iPhone lock screen to even locking and unlocking iOS apps. With the invention of iOS 12, you can now lock and unlock certain apps in your device using Face ID technology, but this feature is only for those using iPhone X. The all-new guest mode in iOS 12 will allow anyone who needs to use your iOS device some certain permission to access some apps and features in your iPhone or iPad in the face of an emergency. iOS 12 users will be able to set multiple countdown clocks on their iPhones. This feature is not available in iOS 11, and you can only enjoy multiple timers in iOS 12. The latest iOS News and More is suggesting to iOS users that iOS 12 will be coming with fast links at the top of the Safari screen and the Search bar will be moved to the bottom of the window. Many iOS users have been clamoring for more features in FaceTime such as conference calls. Now, iOS 12 is bringing conference style calls to iPhone and iPads users who are also using FaceTime app on their device. iOS 12 will come with a new feature called notification dots. Whenever you receive a text message, mentioned in a tweet, have a Facebook notification, or get an alert from an app, two color-changing dots will appear at the top of your screen. Should I Run iOS 12? Yes, I believe iOS 12 is worth giving a shot. The public beta is available now for you to review and see what iOS 12 will look like. You download it now and install it on your older and newer iPhones as it supports both. Are you concerned that your iPhone 5s may not have enough memory storage space for installing iOS 12? There is no cause for alarm for there is a good solution for you. iMyFone Umate Pro can help you maximize your iOS storage space so that you can have enough space to install the update when it's available. 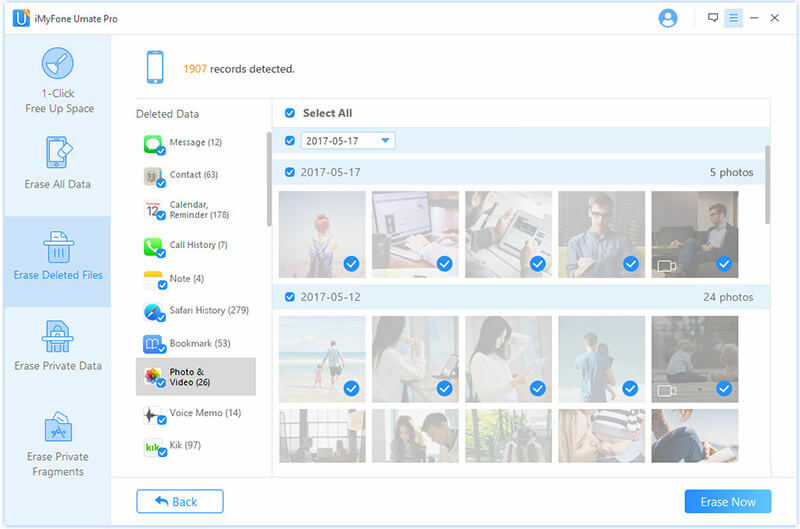 iMyFone Umate Pro for Win or for Mac has the capacity to scan your iPhone in order to fetch out all useless files, data, and apps that are occupying your iOS device storage space. Such files may include deleted app fragments, old and unused apps, large files, photos, videos, multiple copies of a particular media file, cookies, browser caches, etc. 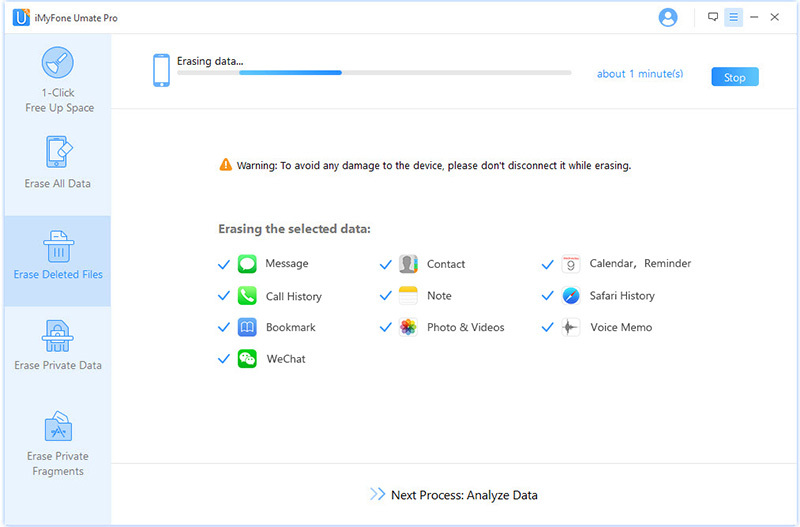 Umate Pro can erase them permanently to recover your iOS space and make such that they don’t enter the wrong hands. 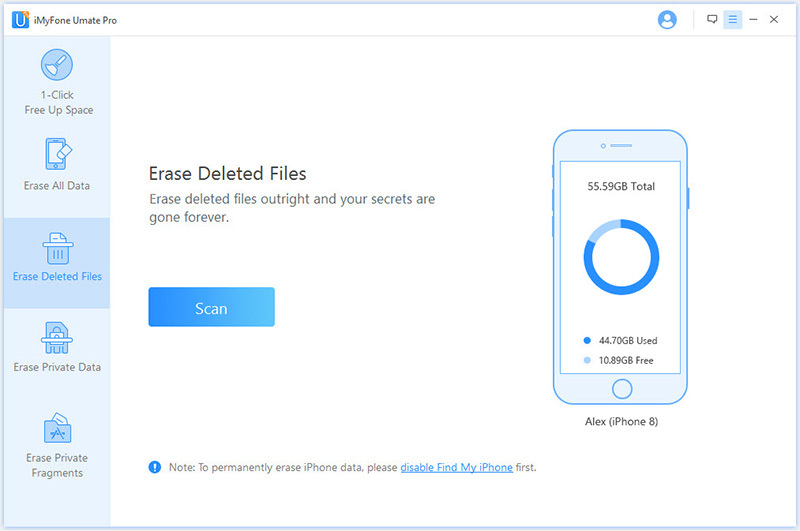 iMyFone Umate Pro can erase deleted iPhone data to free up space and protect privacy. Umate Pro can wipe third-party apps and their fragments to recover your iPhone storage space. It can help you compress photos losslessly, but first backup original copies of such photos on your PC to ensure no photo is lost. It can scan for unused and rarely used files and help you back up and erase them from your iPhone to recover your storage space. Step 1: Download and install iMyFone Umate Pro on your PC. Connect your iPhone to your PC using a USB cable, and launch Umate Pro. Step 2: Choose “Erase Deleted Files” as your erase mode and click “Scan” afterward. Step 3: Preview through the deleted files listed. Then click the “Erase Now”, select your security level and type “delete” into the box. Step 4: Click “Erase Now” button again to start erasing deleted files that are still lurking in your iPhone memory. After this, you will discover that you’ve free up lots of iPhone memory.